President is located in the tropical seaside Jiangjun Boat Harbor in Tainan City, Southern Taiwan and has been manufacturing and exporting luxury yachts worldwide for over 40 years. From a humble beginning in 1968, founder Eddie Yeh has built President’s reputation as a skilful manufacturer of fibreglass boats with its own substantial slipway, allowing all yachts to be launched straight from the shipyard into the water for fit outs, sea trials and general testing, greatly improving the finished quality of the vessels. Home to skilled craftsmen, engineers, designers and support staff, President prides itself on being able to meet the stringent demands of custom building for today´s superyacht owner. Now, almost 50 years after launching their first yacht, the President 41 Sun Deck, President is building 140 ft superyachts and has launched nearly 1,200 vessels exporting to markets all over the world. 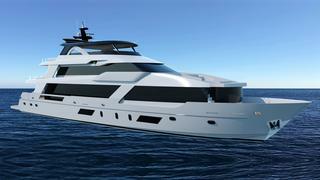 The company has become a worldwide brand selling luxury yachts in Europe, Australia, Japan, China and the United States. Renowned for building yachts of the highest quality, delivering on time and on budget President is committed to continually developing better products with the latest technological innovations. Even in periods of economic recession and extraordinary competition, President has succeeded in maintaining continuous growth and successful sales. The President 140 Yacht is the logical step up from the President 115 Triple Deck Mega Yacht (sold by Oceanline in 2017). 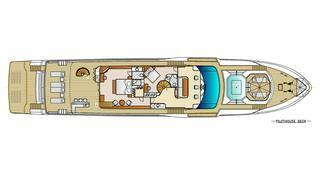 Designed for the discerning owner with a larger family or who enjoys cruising with friends and family in numbers. The standard configuration sleeps 14 in 7 cabins each with their own private bathroom and provision for up to 4 crew in 2 cabins. 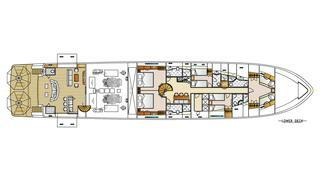 The two full width staterooms are spacious and luxurious with no expense spared, to ensure the comfort of the guests. As you would expect with a vessel of this quality, the configuration can be adapted to suit the individual needs of the discerning owner. The top deck is dedicated to open air entertainment with a huge dining area across from the fully loaded fitted wet bar, not forgetting an optional jacuzzi and surrounding lounge areas for tanning. 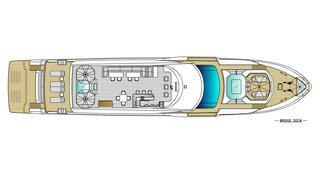 The rendered image of the superstructure of the boat is actual and to scale, while floors plans are proposals which show the potential of the space available; there is an opportunity to create a unique customised yacht from the bilges upwards. 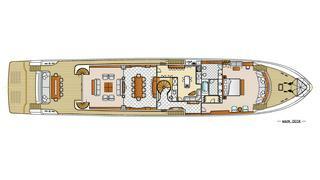 With a hull ready and waiting we estimate the completion time to be in the region of about 18 months. “My wife Barbra and I have recently become the proud owners of a new President 115 Triple Deck Mega Yacht. We purchased the boat late 2017 in the finale stages of the build. We made some extensive changes to the general layout of the vessel to meet our boating needs given the family and crew configuration we had. The builder provided us with a price and time schedule in which the changes would be made. There were negotiations over both and we all agreed to the timing and a fixed price. The Captain and I visited the yard several times during the modifications and were pleased with the workmanship which was of a very high Yacht quality and the vessel was completed on time. President has a number of very dedicated professionals and craftsmen who worked on our vessel. Two of the associates we worked with closely were Agnes the VP of Sales and the Chief Engineer of President “Chief”. Both are individuals with high integrity and very diligent in making sure that the changes we wanted were done on time and of the highest quality. Both are great assets for President and are individuals we all enjoyed working with during our trips to the factory and since taking delivery of the vessel as we had questions about operations and parts. The vessel was delivered to us in Fort Lauderdale early this year and we were basically pleased with the results apart from a few issues with the shipping and off loading by the shipping company. I have dealt with a number of yacht brokers as I have had more than 9 boats over the years that I have been boating and I would say that Daniel of Oceanline was truly a pleasure to work with during the negotiations over the contract, the design and around the changes we made to the boat. He participated in our many visits to the factory and even flew to the US to be present when the 115 was offloaded from the ship. He worked alongside me and the crew to get the vessel ready for our use. He was an invaluable asset working with me and our team and with our dealings with President. I could not be more comfortable recommending him as an individual with high integrity, a hard worker and honesty. I will definitely use him on another build or purchase if the opportunity arises. Considering the excellent build quality, luxurious finishes and a yard that takes pride in its ability to satisfy fastidious superyacht buyers whilst delivering on time and on budget the President 140 Yacht has an one of the most eye catching price tags in the current Super Yacht Market and should definitely be on the short list for any prospective owner looking for value for volume.